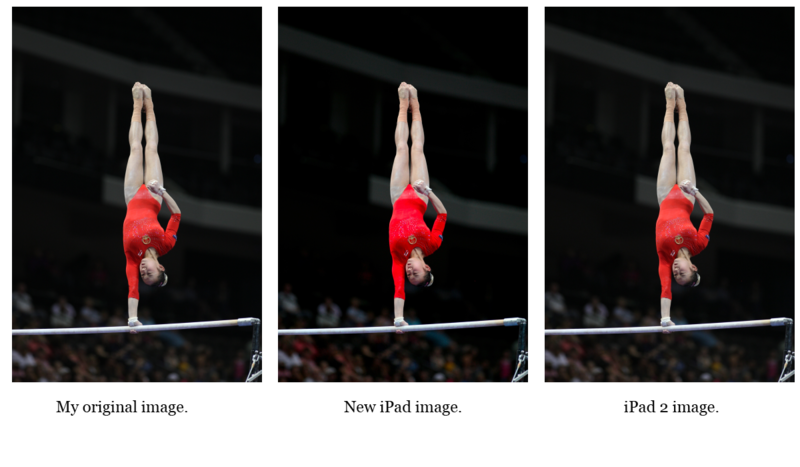 iPhoto vs. Photoshop Touch on the New iPad: Consume or Create? The new iPad has received lots of praise--including from me--for its improved Retina display. But if your pictures look different on the new tablet, with brighter, punchier reds and greens, that may not be solely because of improvements to the screen. It appears that iTunes actually shifts the colors of images, in some cases radically, when it moves pictures from a computer to the third-generation iPad. To be clear, it's not news that iTunes alters photos that it syncs to an iPad. Images sent to the iPad 2 via an iTunes sync undergo an "optimization" process, in which iTunes first downscales and then resizes the image so that it takes up less space on the iPad. But with the new iPad, iTunes seems to be doing something more than just resizing photos, whether by design or by accident. Take a look at this image of a gymnast in a red leotard. The original, 3888-by-2592-pixel image was 3.48MB, and I captured it as a JPEG with a Canon EOS-1D Mark III. Using iTunes version 10.6.0.40 on Windows Vista, I synced the original image to the new iPad. That yielded a photo that retained the original 3888-by-2592-pixel resolution, but took up only 1.05MB of space. So far, so good: The process left me with a version of my image that was appropriate for the 2048-by-1536-pixel Retina display, but didn't take up as much room on the tablet. My original 3888-by-2592-pixel, 3.48MB JPEG photograph, captured with a Canon EOS-1D Mark III. The same image after being synced with iTunes for the new iPad, and then e-mailed back to my desktop PC. The same image after I transferred it to an iPad 2 through iTunes, and then emailed it and reopened it on my desktop PC. The big surprise came when I emailed that second-stage image file from the new iPad, opened it on my desktop PC, and compared it to the original, side-by-side on my monitor. The "new" (third-stage) image showed a significant color shift, with the reds amped significantly to the point of looking oversaturated in comparison with the original JPEG when viewed on the same monitor. Whereas a version of the same picture transferred to and from an iPad 2 in the same way showed a slight change (mostly a small loss of detail and sharpness), the version output from the new iPad was dramatically different. Here's a version that shows all three photos side-by-side for easier comparison. Click the image to enlarge it. This observation tracks with one of my first impressions on testing the new iPad: Colors were vivid, though in our tests we didn't judge them to be oversaturated. To see whether iTunes might be the culprit, I tried emailing the original image to the new iPad (instead of syncing it through iTunes) and then resending that image to myself. The result: The image looked less saturated than the version that iTunes "optimized" for the iPad. Because the image in question had a lot of red in it to begin with, the changes are especially obvious. But my colleague Dave Johnson did some experimenting as well, and he noticed a shift in the reds and greens on a number of his images, though not always to the same degree that I observed. In a pixel-level comparison at 5000 percent magnification of an original image versus an image synced through iTunes, he even found that in at least one instance the same pixel location had two different colors. So what's going on here? Everyone I've discussed the issue with has been puzzled. (I contacted Apple to ask for a comment, but the company didn't respond.) It is easy to suspect that JPEG compression is at fault, since JPEG compression is lossy, meaning that you lose something every time you resave a JPEG file. But the imaging experts I've spoken to agree that JPEGs usually lose detail and sharpness; they don't get brighter colors. Another possibility is that iTunes is changing the color profile of the images it transfers. The metadata for the image doesn't report any changes, and yet the increase in color saturation is very clear across different monitors and operating systems, including Windows and Mac OS X. If iTunes indeed alters the colors of your photographs before depositing them on a new iPad, is that a problem? That depends on how you use the tablet and how picky you are about your pictures. If it makes your images look better on the iPad and that's your main concern, great. But it probably means that the iPad is not an ideal place to keep backups of your images, especially if you're relying on iTunes to transfer those images--as most of us do. And if you work hard to make sure that your images look just the way you want them to, you may not appreciate iTunes "optimizing" them for you--especially since there appears to be no way to turn the process off.